It has been a long year... a long year... sometimes, I feel like I've aged 10! 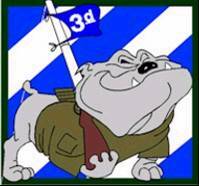 I have had excited emails from a number of 3rd Brigade moms and wives -- even a girlfriend or two. They do not make a meter that can measure this excitement as it builds. Last week the mood was a little blue about the Guys not being home for Christmas, but this week, this letter was posted on the Brigade's website. As I read this letter, tears sprang to my eyes... THE DAY is really coming.... A Day for Happy Tears! Happy holidays! I was pleased to announce on 1 December that the Sledgehammer Brigade has nearly completed its mission and is scheduled for redeployment in January. We are in the final weeks of what has proven to be an extraordinarily successful operation in support of the Global War on Terrorism. Your soldiers have spent the last year working tirelessly to keep America safe and to help rid the world of terror. While there is still much to be done, I can assure you that much has been accomplished. The Soldiers of the Sledgehammer Brigade have worked hard and have sacrificed to ensure democracy in Iraq, and to make our future more secure. Your Soldiers and this team have become the model for success in the Iraqi Theater of Operations. Our redeployment begins on December 18th when a “torch” party of about 30 Soldiers will leave Iraq to help the Rear Detachment set the conditions for a smooth redeployment. About 1 January, an advanced party or “ADVON” of about 100 Soldiers will leave Iraq to make final preparations for the Brigade’s return. From January 5th through the 15th the main body will flow back to Ft. Benning in groups of 200-500 per day. [whooohooo!!!] On some days no one will arrive, and on other days over 600 Soldiers will arrive. Aircraft availability will determine the exact dates and numbers. Finally, on the 28th of January, the Brigade’s trail party will come home. [well yes, someone has to be last -- just hope it's not our Guys!] We will redeploy as a Brigade and not by individual companies or battalions, so each returning aircraft will have soldiers from different battalions and companies. Most Soldiers do not yet know the exact day they will leave Iraq, and when they do leave, it will take about 4 - 6 days for them to get back to Georgia. We are redeploying on a program called Single Ticket Express. That means our redeployment will work the same way R&R leave worked. Individual soldiers from every Battalion will move from Iraq directly to the United States with only a few short processing stops along the way. As we get exact departure dates we will inform your Soldier and the rear detachment. When your Soldiers arrive, they will turn in some equipment [we can only guess LOL], fill out a few forms [one will be too many!] and we’ll hold a very brief welcome ceremony. [define "very brief" to a husband or wife who have been apart so long!] From there, your Soldier will be released for at least the next 48 hours! When the 48 hour pass is complete, everyone will begin 10 days of reintegration training. We’ll have weekends off and most duty days will end by 1500 hrs. 30 Days of Block Leave will begin on February 4th. Your greatest concern is probably how you will find out what day and time your soldier will arrive. [you betcha!!] The short answer is that the Rear Detachment will tell you. On December 12th, LTC D will begin conducting reunion briefings that should answer all of your questions. During the reunion briefing, LTC D will address a number of important topics. He will explain how and when you will be notified of your Soldier’s arrival and he will explain in detail what will happen when your Soldier’s plane lands. I encourage all of you to attend this very important briefing. The best way for you to stay informed is to call the 1-800 phone number for your battalion’s rear detachment. Sledgehammer! Rock Of The Marne! Lord, Please protect our troops and see them home safely to those who love them. Glad it's getting closer! I know from experience these last few weeks are the hardest. I'm so excited about their return. I wish I could be there for that reunion- it's something I've seen on TV and experienced as an infant but have no memory of since I was so little.